Danger is never won without danger. 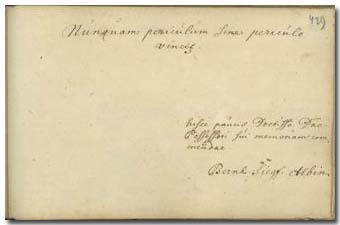 Bernhard Siegfried Albinus (Albin) was born on February 24, 1697 in Frankfurt an der Oder, the son of the physician Bernhard Albinus (1653-1721) and of Susanna Catharina Rings. He studied with his father and with the professors Govard Bidloo (1649-1713), Herman Boerhaave (1668-1738) and Johann Jacob Rau (1668-1719) in Leiden, then in 1718 he went to Paris to study anatomy and chirurgy. Following Boerhaave's mechanistic theory, he strived after getting to know all the structural parts of the body. At the age of 21 he was already extraordinary professor of anatomy in Leiden, and he was awarded doctoral degree without defence. After the death of Rau he followed him in his professor's chair. In 1721, at the death of his father he became ordinary professor of anatomy and chirurgy, and in 1745 professor of medicine as well. He led these three chairs until the end of his life. He was a member of the scientific societies of Leiden, Haarlem and St.-Petersbourg. He died in Leiden on September 9, 1770. He was the most important anatomist and professor of medicine of his age, renewer of descriptive anatomy. Petrus Camper (1722-1789) criticising his method of description, nevertheless called him “prince of anatomists”: “anatomicorum princeps magnus Albinus”. He was the first to demonstrate the connection between the blood circulation of the mother and that of the fetus. His works were characterized by accuracy, clarity and rich illustrations. Two of his works, the Libellus de ossibus corporis humani (Leiden, 1726) and the Historia musculorum hominis (Leiden, 1734) were used for generations, even in the 19th century. He published, together with Boerhaave, the works of Vesalius, Bartholomaeus Eustachius and Harvey. His best known work is the Tabulae anatomicae sceletti et musculorum corporis humani, Leiden, 1747, with the gorgeous illustrations by Jan Wandelaar (1690-1759). To this work his youngest brother and his successor in 1770, Friedrich Bernhard Albinus (1715-1778) published a separate commentary: De natura hominis libellus. Leiden, 1775. The younger Albinus did not date his note. He probably wrote it in Leiden, while still a student, at the same time when his father, the professor of medicine (p. 105), that is, in May 1715.